Now you’re looking ahead to a retirement you’ve always dreamed of. We’ve helped many people retire earlier, and with more income, than they thought possible. Are you confident that your savings will last, that you’ll live comfortably without worry of that which you cannot control? And will the advice you receive be fact-based, research-rich, and time-tested? Think of us as advisors on a mission. As world markets become increasingly complex and more and more responsibility for planning a successful retirement falls on the shoulders of employees, there has never been a more critical time to find professional advice-givers that you can trust. Our mission is fairly straightforward but now more important than ever. To this end, we remain fiercely independent as a firm, under no obligation to sell products or fulfill company quotas. The focus is on you, the client we serve. And the mission is clear. Fourth Dimension Financial Group exists to help people seeking financial retirement ACHIEVE ENOUGH, LIVE FULLY, AND HELP OTHERS DO THE SAME. …but it must be planned right. After fifteen years of retirement planning for and serving successful retirees, we’ve come to understand that although every client has very different specific needs, they all want the same kind of experiences from their advisor. We work diligently with each client to understand their unique retirement planning objectives and pair those objectives with customized solutions that reduce uncertainty. We collaborate all paperwork, integrate with other advisors, and provide account reporting services. We are committed to ongoing client communication and planning reviews to ensure plans remain on-track and consistent with the changing needs of each client. 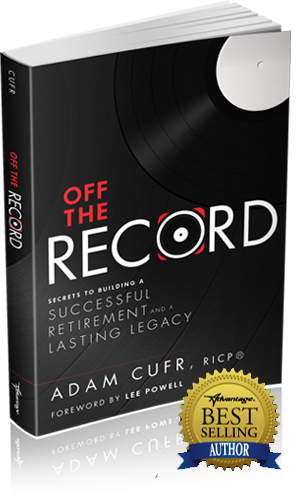 Written for the person nearing or in retirement, OFF THE RECORD – Secrets To A Successful Retirement And A Lasting Legacy is an in-depth discussion of the four dimensions of retirement preparation – income planning, risk management, tax strategy, and estate planning. Above all, retirees must recognize the importance of time itself – often considered the fourth dimension in our 3-D world. We maintain a relationship with our clients in many ways, including our weekly articles and print newsletters.